2006, 2009, 2014? How to prevent the next gas crisis? Russia stopped gas supplies to Ukraine in mid-June. If there will not be an agreement between Gazprom and Naftogaz, Ukraine will need to significantly curtail its gas consumption this winter, even if it can import substantially more gas from the West. This would increase the probability of a stop of gas transits through Ukraine. A depoliticisation of the gas negotiations is hence in the interest of Russia, Ukraine and the EU. In case no agreement can be reached, the probability of a transit stop can be reduced by increasing supplies of gas to Ukraine from the West. As a last resort, the EU member states should prepare for mitigating the cost of a transit stop. On June 16th the gas negotiations between Ukraine and Russia failed. As a consequence Gazprom stopped delivering gas to Ukraine. The differences in negotiation positions on the gas price did not seem insurmountable. Ukraine apparently offered 320 USD/thousand cubic meters (tcm) and Russia demanded 380 USD/tcm. It was supposedly more important that the partners disagreed on how a change in gas price would be implemented. Ukraine demanded a change in the contract while Russia offered an – unilaterally reversible – reduction in the Russian gas export tax. Thereby the Ukrainian side feared – despite Russian promises – to get under pressure in a more problematic situation (e.g., in winter). Both sides called the Stockholm court of arbitration. Russia claims a breach of the existing contract and unpaid debt of USD 4.5 bn. Ukraine claims a revision of the price formula in the 2009 contract based on a revision-clause in case of ‘fundamental changes in market conditions’. Last year (2013) Russia supplied 26 billion cubic meters (bcm) to Ukraine. That was 52% of the Ukrainian demand of 50 bcm. Another 21 bcm of natural gas were produced by Ukraine and about 2 bcm imported from Poland and Hungary. Ukraine is able to bridge a supply stop of Russia for several month based on domestic production, gas imports from the West and a reduction of storage levels. However, if storage levels run too low (< 10-15 bcm) at the beginning of the winter, supply problems are to be expected towards the end of the heating season, even if Russia restarts deliveries in the meantime. During the last winter about 12 bcm were withdrawn from the storages to cover the seasonal demand peak. Current storage volumes are reported to be around 15 bcm. Ukraine will find it difficult to undergo a sustained supply shock. 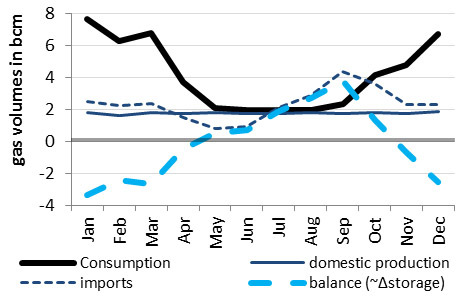 Even if gas imports from Poland, Hungary and Slovakia (‘reverse flows’) are increased to a theoretically possible volume of 15 bcm per year, Ukraine would lack another 15 bcm per year compared to the demand of 2013. There are only limited options to increase domestic production in the short term. And even a small increase would among other things require raising the price paid to the state-owned producers – which are currently only receive about 50 USD/tcm. Hence, a substantial reduction in total gas consumption is necessary to secure heating for the population (about 20 bcm) and operation of the transit system (2-4 bcm). Correspondingly, the Ukrainian government decided to reduce the gas consumption of industry and communes by 30% and consumption of schools and hospitals by 10%. A big challenge for Ukraine is not getting accused of withdrawing gas foreseen for transit. The difficulty is that the gas transit is operated through the normal Ukrainian high-pressure gas transport system. On the one hand there is a risk that due to the difficult supply situation gas is wrongfully withdrawn at the local level which cannot be balanced elsewhere. On the other hand, it is impossible to establish beyond doubt who is responsible for a reduction in gas volumes arriving in the West as injections into the Ukrainian system are only monitored on the Russian side. In contrast to 2006 and 2009, Ukraine should this time have strong incentives not to give Russia a reason to stop gas transit. The reason is, that a transit stop would make gas supplies to central and eastern Europe much more difficult. In this case it is questionable whether Poland, Hungary and Slovakia would still be able to supply significant volumes to Ukraine. And even if a limited supply where still technically possible (maybe requiring rationing in central Eastern Europe) it might not be politically opportune if Ukraine is responsible for the transit stop. Up to date the transit of gas through Ukraine is undisturbed. Ukraine repeatedly stated that it will not withdraw Russian gas foreseen for transit. Gazprom also confirmed its intention to fulfil its obligation with Western buyers. However, the risk of a stop of the gas transit increases with every day that Ukraine and Russia do not find an agreement on gas deliveries to Ukraine. In the politically charged situation, both sides might be tempted to further escalate the conflict in a way that would be economically detrimental for either side. In addition there are technical risks. The Ukrainian gas transport system was not build for accommodating supplies from the West. Exceptional gas flows originating from the Western border and the West-Ukrainian storages towards the East Ukrainian demand centres need to be operated manually. It is also unclear, how much gas can be actually withdrawn from the storages. Finally, low storage levels might cause Ukraine to not meet its transit obligations during winter time. Typically, Ukraine receives more transit gas from Russia than it delivers towards the West during summer and it delivers more gas to Europe in Winter than it receives from Russia. In case of too low storage levels, there are insufficient pipeline capacities to bring Russian gas into western Ukraine during heating season to cover the increased European winter demand. A stop of the gas transit through Ukraine would have a measurable effect on the European gas supply. Instead of the 130 bcm delivered in 2013 Russia would than only be able to deliver 75 bcm per year through Belarus and Nord Stream. On the aggregate European level it might be possi-ble to compensate this shortfall from alternative sources. Absent substantial technical and administrative preparations there is, however, a risk of a gas shortage in south-eastern and central-eastern Europe. A stable gas agreement is in the economic interest of Russia, Ukraine and the EU. Such an agreement is more likely if the negotiations are isolated from political discussions. In case of a prolonged Russian supply stop, the EU has an interest to enable sub-stantial ‘reverse flow’ supplies to Ukraine at usual market price as this enables and incentivises Ukraine to ensure gas transit. Finally, EU member states should coordinate measures to mitigate the impact of an eventual transit disruption.